Their group name has changed also. Instead of the terror-inducing “Viking,” they are now called Scandinavian. Norway, Sweden, Denmark, Finland, and Iceland are today’s caretakers of that once-feared genetic pool. As their culture morphed, so did their method of captivating the world. Instead of heading out in those wondrous, fabled long ships to terrorize the world into giving up its wealth, the new Vikings have softened that approach — now, they invite the world to stuff its wealth into its wallets, board those modern, sumptuous cruise ships and head for Scandinavia where they can be delighted with the quaint, the modern, and some wonderfully dreamy scenery amid the haunting echoes of history. (Those in a hurry to hand over the goods can fly via Viking Air… well… maybe that’s Scandinavian Airlines). The Viking heirs still get the world’s money, but, now, in total reversal of methodology, the world hand-delivers it willingly to the Viking homeland without fear of losing a hand… or any associated body parts. Responding to this kinder, gentler approach, the world welcomes Viking travelers. In times past, coastal cities being visited and not pillaged insisted that those ruffians come ashore only in small groups while the rest waited off-shore in their ships. A small group’s rowdiness could be easily contained, but, there was the fear that a large group might try to paint the town red (a la Freddie… Jason… Lizzie Borden. **) Today, they simply blend in with everyone else on the travel conveyance and are permitted to off load without fanfare… unless they are celebrity, of course… or brandishing an Ulfberht. I, personally, have much enthusiasm for the blue-eyed, gentler Vikings… those not named Olaf, Dolph, Karl, Hans or other such. I favor name types such as Brita, Anne, Annelie, Katarina, et al, complete with appropriate attributes. * True, in my adolescence, I romanticized those Viking warriors, but, at some point I woke up and appreciated the fact that warrior glory came at a horrific price for those falling to that ethic. Besides, I was too short to effectively wield a long sword… hmm! I had the same problem with golf clubs… spent a lot more time replacing divots than swinging at the ball. Through 300 years or more, these seafarers explored, pillaged, and colonized; the New World and the Old have benefitted from their legacy. Yet, in my little world, the fingers on one hand are far more than needed to tally personal encounters with it… although… I did spend about five months with one Dagmar from Denmark. The most memorable thing about that relationship was, if you failed a test, you kept taking it until you got at least a “D” on it. She practiced the slogan “No Child Left Behind” long before it became politically chic… I got out of Latin I with a long string of D’s and a fuzzy recollection of the ablative case. Ironically, given my adolescent crush on all things Viking, I had no clue she was a DANE possessing the very genetic heritage I then romanticized. Mrs. Dagmar Root (Latin teacher, Sam Houston Senior High, Houston, Texas a very long time ago), belatedly, I thank you for that close encounter with living history. Rare and to be treasured are these Norse encounters. I could use another one. This is an open invitation to a tall(er) blue-eyed Dane (not named Olaf or such) to share lunch over Viking fare (with emphasis on sea food***) sometime in the near future (a few days… weeks… a month? I’m very patient.) 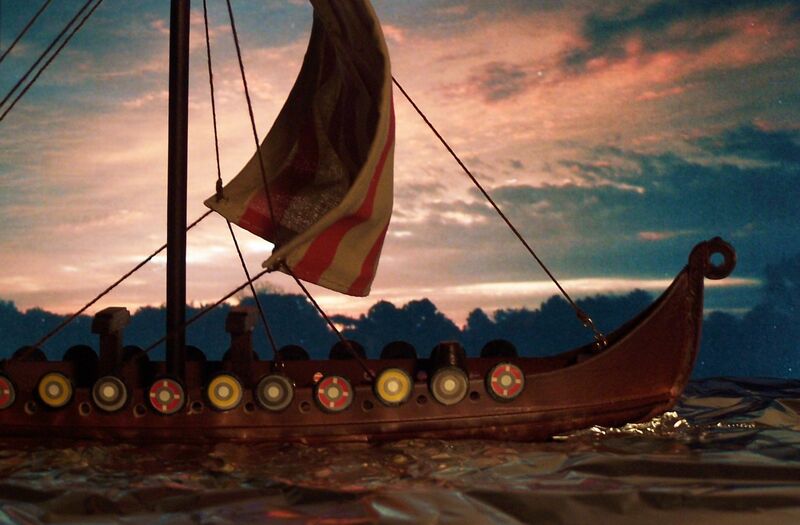 Since I surmise that the rewards for such an encounter would be heavily weighted in my favor, I will throw in the long ship pictured above to help balance the scales. According to the ancient Nordic time wheel (which I just now invented), it is my turn to buy. *I’m a guy and still breathing; would you expect less? **Freddie and Jason are fictional; Lizzie and the Vikings of old were the real deal. ***I am open to other preferences expressed by the lucky lunchee.